Ugh. I really have to stop spending my weekends eating garbage. I eat healthy, tasty food all week, but then the weekend comes and BANG....I have a ridiculous urge to eat crap. I was on my own for dinner last night, so I came up with the uber-creative perogies and sautéed zucchini. I was tempted to order pizza, but perogies and zucchini didn't turn out to be as bad a combo as I had been fearing. Actually, it was kind of good. Or maybe the half bottle of chardonnay that accompanied it made it good. Of course, it would also be that same half-bottle of Chardonnay that led to the demise of all semblance of healthy eating later that night - hubs went out and bought chips and dill pickle dip. And of course it was the large container. Yum. I guess the goodness of the dip made up for the absolute crappiness of the movie (the second Pirates movie). I loved the first Pirates movie, but this was utter crap. I hated it. Meh. But I'm thinking that my hips probably could have done without all those yummy chippies.....but hindsight being what it is....they were tasty. 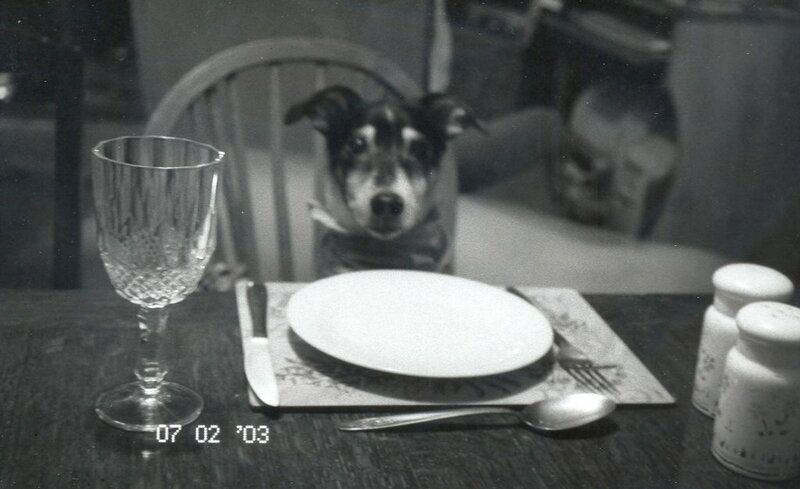 Dinner was better though. I had some wonton wrappers leftover from last time, so I decided that I would make ravioli. 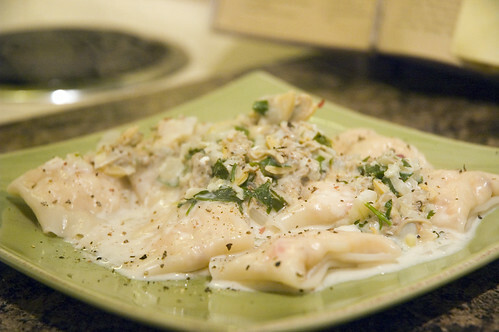 Thumbing through my various back issues of Cooking Light, I found a recipe for crab ravioli with a red clam sauce. Given the Ottawa seafood situation (flown in twice a week, at best), I appreciated that this recipe allowed for the use of canned seafood (actually it even benefitted from it)...I know it's not the same as fresh crab or clams, but in this recipe, it's super tasty, and your wallet will thank you for not making the trek to your friendly neighbourhood fishmonger. Of course, hubs had to throw a bit of a wrench in my plans. I was all set to make the red clam sauce, but he wheedled and cajoled me into making white instead. To boot, this was AFTER we went grocery shopping and I picked up all the ingredients for a tomato-based sauce. 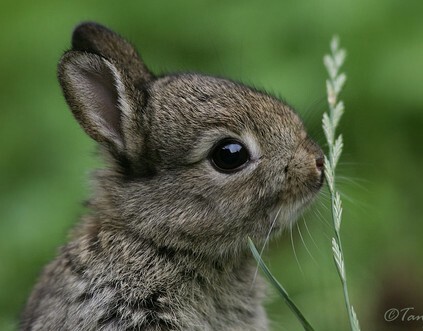 But he's awfully cute, so I humoured him. Hubs says I can make this one again anytime - he scarfed it down pretty quickly, and I would be willing to make a bet that tomorrow's "lunch" won't make it much past 10AM. This recipe is a little time-consuming (mainly the ravioli-stuffing part), so don't try making this on a weeknight unless you're cool with eating at nine. I'd say this took about 90 minutes, start to finish (about 40-45 being dedicated to ravioli creation). I have yet to tackle making my own pasta, so I was just using purchased wonton wrappers. One of these days, I'll find myself a pasta roller and tackle the task of homemade pasta, but in the meantime, I'm relatively content with the wonton wrappers. 1. 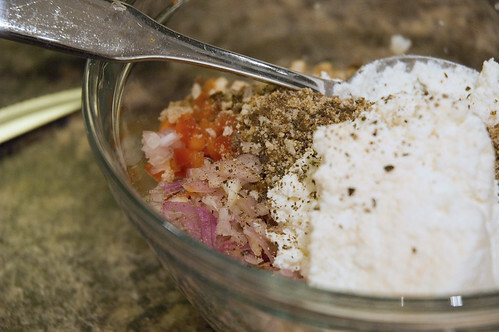 In a bowl, combine crab, ricotta, red pepper, shallot and breadcrumbs. Add some pepper (and salt if desired). 2. 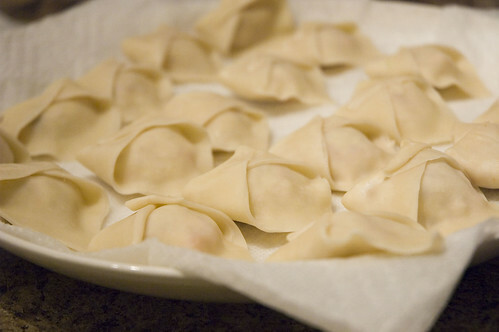 Keeping remaining wonton wrappers covered with a damp towel, take about 1/2 T of filling and place it in the centre of one wrapper. Moisten the edges with water. 3. 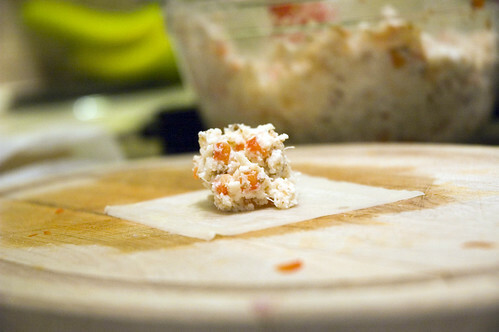 Fold the pasta over the filling and seal the edges, being careful to push out any air pockets. It might take a good smoosh or two to get those pesky edges to stay together. 4. Moisten the sealed ravioli along the long end. Fold the sides over, to make a cute little package. 6. To cook pasta, bring water to a gentle boil and cook for approximately 4 minutes. Drain. Serve hot with sauce. 1. Melt butter in a 10inch skillet over medium-low heat. 2. Add onion, shallot and garlic (again, don't necessarily follow these directions.....I think the garlic was a bit too much...but one of my cloves was ginormous, so this could also explain a bit...). 3. Once the aromatics are translucent (4 minutes or so), add the white wine and bring to a boil. Then add the clam juice and the clams. 4. Stir in sour cream and cream cheese (to make your life easier, cube the cream cheese beforehand....it doesn't melt all that quickly). (At this point, drop the pasta in the boiling water). 5. Add parsley and black pepper. Serve sauce over hot yummy ravioli. This sauce would also be good on linguine if you didn't feel like going to the bother of ravioli (and it is a bother). These look very cute! Innovative use for wonton wrappers! My husband used some in a similar way (he filled them with crab) but then deep fried them and had them with Lo Mein! I just wanted to say I made your roasted potatoes on the weekend and they were amaaaaazing. The rosemary was the absolute perfect herb to match with them. Great stuff. I have been looking all over for wonton wrappers - where did you buy them? I'm now NEEDING to make the pea ravioli. Wow...your ravioli turned out so nice! I used dumpling wrappers last time and I baked the raviolis instead of boiling. The meal was tasty but the wrappers fell apart pretty badly. So I don't know if the problem was with the baking part or the dumpling wrapper part (which is much thicker than wonton wrappers). Next time though, I'll definitely try it your way!! Thanks for all the comments!!!! canarygirl - thanks! they were very yummy! first_2b_abride - glad you liked the potatoes. It's one of my favourite side dishes in the world. I'd be happy to eat just that for dinner. Wow. Seriously wow. This looks incredible.